This was my entry for the 2016 Jerwood Open Forest competition. A £30,000 commission, set-up in conjunction with The Arts Council and the Forestry Commission England, to create a sculptural work within an unspecified woodland location. They provided no brief for this competition, other than to ask, simply, that applicants "explore the potential of forests as sites for art". As a student of architecture, this was all the instruction I needed and I soon became fascinated with the distinct qualities of space possessed by the both forest and (that conventional site of art) the gallery. I recognised that each had a consistent aesthetic, one entirely "organic" and the other entirely "inorganic", well suited to the expression of art. Yet with that, they were both antithetical in their essence of “time". The forest was a place full of time: home to the temporal manifestations of nature. Whereas the gallery was a place free from time: accommodating only its abstract notion of measurement. I felt that the convergence of these two forces, the time(lessness) of the gallery within the time-bound context of the forest, was a unique opportunity to express the tension between them. Something, which in contemporary life is as much enigmatic as it is instrumental - the superimposition of abstract time responsible for both our liberation and oppression, simultaneously. Moving on with this idea, I began researching symbols that, either historically or fictitiously, pertained to this notion of "timelessness". Taking particular influence from Kubrick’s ‘monolith’ in 2001: A Space Odyssey and Super Studio’s ‘Continuous Monument’ from their polemic photomontages of the late 1960’s, I came to design a 1.6m high black pyramid with a simple pendulum hanging in the centre (visible only from one side). For me, the pyramid was a shape that had been consistently adopted throughout history and therefore expressed a sense of "timelessness" through its sheer universality. The pendulum, on the other hand, was a relic of our Cartesian sensibilities and therefore symbolised mankind’s desire to abstract and measure (time). 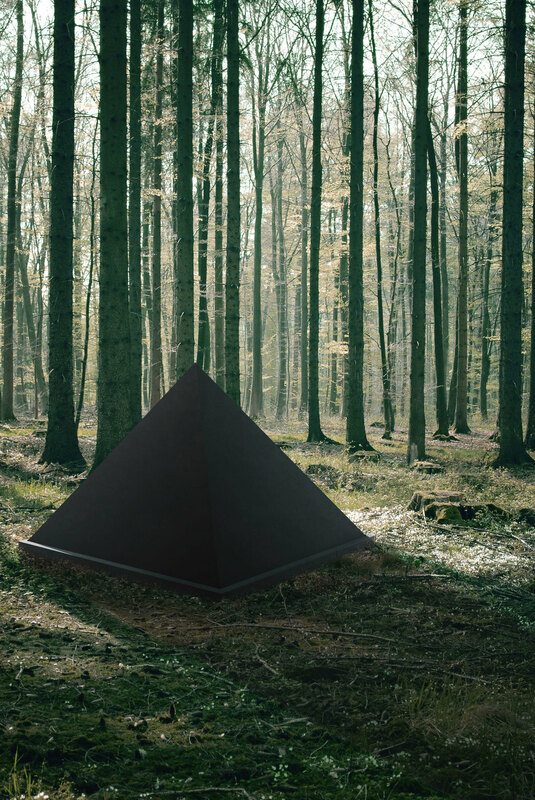 Formed of black metal and glass, the pyramid was designed to resist the traces of time that occurred ubiquitously within the forest environment, thereby evoking nothing of its organic surroundings. The scale of the sculpture was also carefully established to ensure that it only reflected a legitimacy of authority equal to that of the individual actor and not an intrinsic subservience to it (by being larger) or, indeed, a mastery of it (by being smaller). The principal part of this submission was a 500 word proposal, accessible here.